Box after box of donations are pouring in to fill the food pantry at the YMCA in Lawrence and Andover, Massachusetts, to help the displaced Merrimack Valley residents. 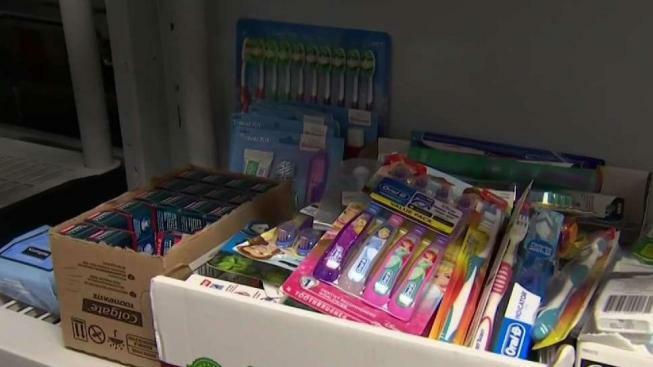 People can get anything from toiletries such as toothbrushes to microwavable foods so they can get through another few weeks without gas. "We opened this on Monday and we had 100 families show up," one YMCA worker said. "We think that need will continue and possibly grow." Now that the organization’s gym has hot waters, they have opened it to the thousands of explosion victims who remain without any gas. "We've opened our branches for showers so anyone in the community can come to our Andover or Lawrence facility and take a hot shower, get a work out in, even just relax in our lounge," a YMCA worker said. Over at the Cor Unum Meal Center in Lawrence, workers take pride in staying open because of the emergency. "You didn't know if it was the end of the world or what was happening," a worker said. Volunteers said since the tragedy, they have not stopped serving breakfast or dinner. Even without gas service, they have managed to serve cold, bagged lunches to go. "Why not? There are so many people in need," said volunteer Cynthia Johnson.